The Avanti is an Italian twin-engined executive turboprop. 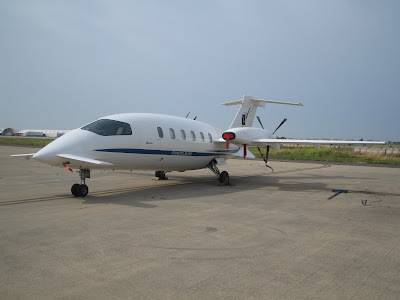 The Piaggio is the fastest turboprop in the world (Cruise speed of 320 knots), and one of the most revolutionary planes of this time. According to Piaggio Aero, the fuselage of the Avanti produces 20% of the plane's lift. The cost of one of these planes is about $7 Million US. Anyways, back to the flying. Today was a review flight of stalls and steep turns before I begin circuit work. I haven't gone over steep turns here so I'll do that now. A steep turn is really just like another turn except you add a few more things. A steep turn in a Katana is an angle of bank between 30 degrees and 60 degrees (60 is the max). As you begin to roll past 30 degrees, you will need to apply a fair bit of back pressure on the stick (the nose should be slightly above the horizon) and as you continue to roll to about 45 degrees, increase power slightly (In the Katana, increase from the cruise power setting of 22" Manifold Pressure to about 23" MP). If all the steps were followed, you should be turning at a pretty rapid rate, but your airspeed and altitude should remain constant. To recover simply roll out of the turn and reduce your pitch and power back to cruise settings.